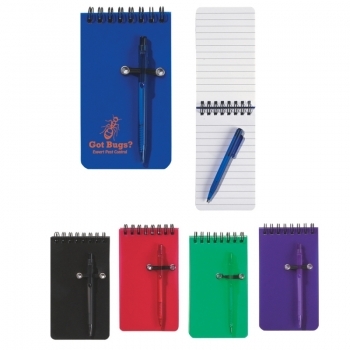 Customized spiral jotter and pen are affordable, adorable, portable and very useful, too. It is very rare that you find all these synonyms in place. This spiral jotter and pen can be handed out as a sales driving token during promotional events or it can be handed out as a complimentary at the end of any joyous event. Marketers who are trying to build trust with minimum efforts can always rely on this jotter and pen set to find their purpose. Bulk orders are eligible for discounts. Request for quote to know more. Colors available – Frosted: Green, Red, Blue or Purple. Solid: Black. Available Colors : Frosted Green, Red, Blue or Purple. Solid: Black.